Are you a lager than life character or a pale ale connoisseur? An activity said to date back to the fifth millennium BC, guzzling beer is one of the oldest pastimes enjoyed by thirsty people the world over. The drinking experience has only been improved by smartphones in the modern age, and whether you consider yourself a lager than life character or a pale ale connoisseur, you won't be short of options when looking for a Samsung GALAXY S4 app that suits your needs. Now's the best time of the year to discover what's out there too, what with a hop-filled sea of beer festivals on the horizon, including the Kent Beer Festival on July 18 – 20 and the Great British Beer Festival on August 13 – 17. We're off to pour ourselves a pint. Before you do the same, remember the following: UK law states if you're under 18 and drinking alcohol in public, you can be stopped, fined or arrested by the police. It's also illegal for anybody to sell, or attempt to sell booze to you and you can even fall foul of the law by drinking alcohol in licensed premises. You can, however, drink alcohol with a meal with if you're accompanied by an adult and aged 16 or over. Whatever age you are, always remember to drink responsibly. Now that's out of the way, here's our pick of 10 of the best beer-themed apps. Drinking beer has been a traditionally social pastime throughout the ages, so it was inevitable that a social network designed to connect likeminded people with an interest in the activity would rise to the top of Google's Play store like a barrel full of delicious yeast. Simply put, Untappd is a social networking app that treats beers as people. This allows you to 'follow' them to see which pubs they're offered in. And they even trend, Twitter style, if enough people are drinking them. Of course, Untappd is all about being social, and the app also allows you to track, rate and take photos of beers, which can then be shared with friends. It will also reward you with badges for trying different styles and visiting various haunts, introducing a competitive element. (Not that drinking needs one, if we're honest). A guide to beer apps wouldn't be complete without mentioning the Good Beer Guide by CAMRA (Campaign For Real Ale). A mobile version of the same award-winning guide published by CAMRA every year, this 'yellow pages of ale' features full reviews of 4,500 pubs throughout the UK and includes details of every real-ale brewery and their regular brewers. To get the most from the app you'll have to sign up as a CAMRA member to unlock its full potential however, or you'll be limited to viewing information about a single venue. If you're serious about real ale, it's the most comprehensive offering of its kind out there. The best-designed app on our list, Perfect Pint looks stunning on the GALAXY S4's generous Full HD Super AMOLED display. It acts as a virtual map of real ales, pubs and beer festivals around the UK, meaning a quick flick of the smartphone's GPS feature will have you racing to the nearest venue in moments. Perfect Pint also allows you to track down venues that offer a certain type of drink, such as bottles, rather than draft, making it a good shout if you're in the presence of picky company. 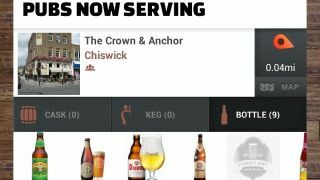 The app also allows you to add tasting notes for any beer sampled in a pub, meaning it's a constantly evolving live directory. Nifty.